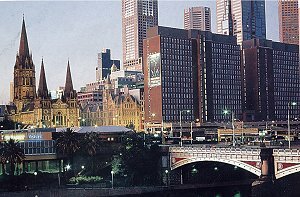 MELBOURNE, CITY OF CULTURE : Melbourne, established in 1835, is Australia's second largest city with a population of around 3 million. For over a century, from the 19th century gold rush, this was Australia's establishment capital, and is still the fashion and food centre of the country. The Yarra River flows through the middle of Melbourne's historic central business district and under the Princes Bridge beside Flinders Street Station. Lygon Street, Carlton has many coffee bazrs, boutiques and pubs and one block away is the venerable Melbourne University. Suburbs like Brighton Beach, beside Port Phillip Bay, offer good sailing opportunities, plus access to the cafes and seafood restaurants of neighbouring St Kilda. Melbourne's grand Victorian era buildings are an example of the wealth created by the 1850s gold rush. Complemented by the architecture of later eras, Melbourne's central business district still conforms to the orderly grid laid down by the city's founding fathers. City trams at the top of Swanston Street and the beautiful 1903 City Baths maintain the continuity of Melbourne traditions. In Brunswick Street, Fitzroy, just north of the central business district, buskers are found performing amid a gauntlet of ethnic restaurants, coffee and wine bars, fashion shops and galleries. 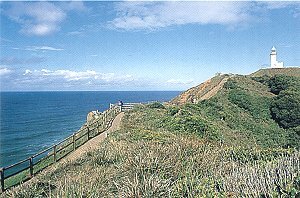 THE GREAT OCEAN ROAD : Winding several hundred kilometres from Geelong to Port Fairy, the sinuous Great Ocean Road is one of Australia's most spectacular roads. Along it, the classic point waves at Bells Beach make great viewing, especially during the Easter professional surfing competition. Further on, near Port Campbell, limestone cliffs battered by the sea have created kilometres of dramatic forms, culminating in the spectacular Twelve Apostles-a series of tall, sculpted rock chimneys stranded in the surf. THE COASTEL HILLS : Beyond port Campbell National Park, 25 million year-old limestone outliers, such as the Island Archway, dot the coast. An hour's drive east of Melbourne are the Dandenongs, a range of hills blooming with many spectacular private gardens, including the Alfred Nicholas Gardens belonging to the Burnham Beeches mansion. The founder of the gardens, Alfred Nicholas, was the inventor of aspirin and lived here until Word War ll. The Dandenongs can best be seen from Puffing Billy, a nar row gauge steam train which travels 10 kilometres trough lush bushland.